After 2.7 billion kilometers and almost 5 years, Juno successfully entered Jupiter’s orbit in the early hours of today morning. Subsequent to NASA’s Galileo mission (1995), Juno is only the second to have accomplished this feat. While in orbit, the Juno mission aims to better understand the gas giant in the following 20 months of its science phase. Juno also happens to be the fastest ever craft built by humans, travelling at speeds of over 260,000 kilometers per hour (74 km/s). To arrive at Jupiter, Juno took an elliptical heliocentric orbit through the Solar System involving an Earth fly-by two years after launch. 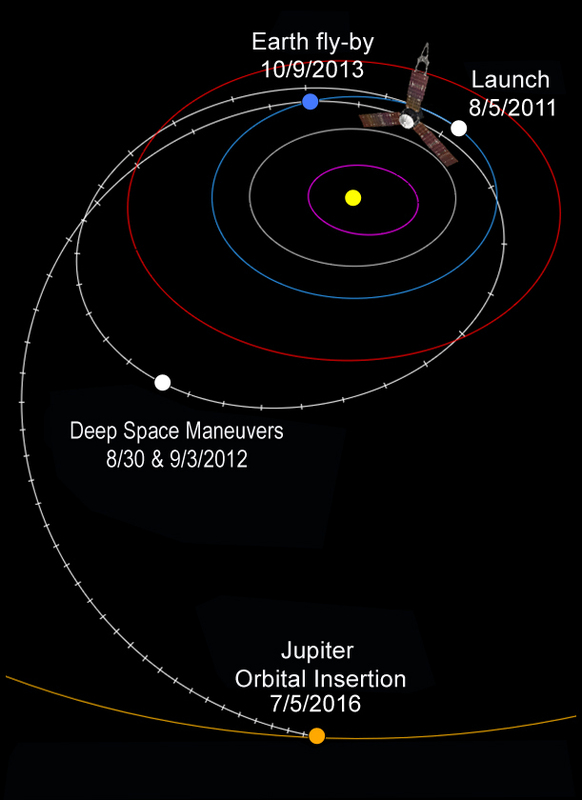 This fly-by provided Juno with a further boost of around 3.9 km/s, enabling Juno to reach Jupiter in just under 5 years. “Juno, welcome to Jupiter” were the words heard throughout NASA mission control after the 35 minute engine burn which put Juno into orbit. In the beginning, Juno will make about a 53-54 day orbit around Jupiter during which its scientific instruments and capabilities will be switched on and checked. In October, the real “science-ing” will start when the probe will be made to orbit the planet’s poles in a 14-day science orbit. This orbit will be extremely elliptical and has been designed keeping in mind Jupiter’s extreme radiations. Juno is expected to perform around 30 such orbits around Jupiter in the science phase. Mission Juno aims to study the formation and evolution of the largest and oldest planet of our Solar System, Jupiter. Apart from trying to understand the enigmatic atmosphere of Jupiter, the probe will study its magnetic and gravitational radiation and also, what is Jupiter really made of. When our solar system was formed around 4 and a half billion years ago, Jupiter was likely one of the first planets to be formed. This is believed so because it is mainly made up of the light gases that make up the Sun- hydrogen and helium. Hence, it would have formed when the Solar system was still young. A deeper understanding of Jupiter and it’s history might lead us to answers about the origin of solar systems.